Within the compact car segment, there are few models that possess the reputation and value of the Toyota Corolla. More than 43 million models sold in 50 years of production is a testament to the quality, reliability and durability provided by the fan favorite sedan. Available in seven trim levels – L, LE, LE Eco, XLE, SE, XSE and a 50th Anniversary Edition – finding the right fit for your budget and lifestyle can be a tough decision. Take a closer look at popular Corolla trim levels in this 2017 Toyota Corolla LE vs 2017 Toyota Corolla SE trim level comparison at Downeast Toyota. What are you looking for in a compact sedan? A sporty style? A fuel-efficient performance? Or maybe and affordable price and great value? Regardless of what you are looking for, the 2017 Toyota Corolla will deliver on all counts. With a fun-to-drive 132-horsepower 1.8-liter four-cylinder engine under the hood, the Toyota Corolla delivers a fun and efficient performance. Married to a Continuously Variable Transmission, the Corolla will make 28 mpg in the city and 36 mpg on the highway in standard trim levels. Take a closer look at the differences between the Corolla LE and Corolla SE below. What Are the Differences Between Toyota Corolla LE and Corolla SE Trim Levels? 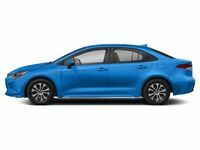 Price, affordability and value are key components of any car-buying decision and will factor into this 2017 Toyota Corolla LE vs 2017 Toyota Corolla SE overview. Perhaps the most popular trim level in the lineup, the value-packed Corolla LE starts at just $18,935 and comes complete with a 6.1-inch Toyota Entune touchscreen display, Bluetooth connectivity and a standard rearview camera that carry over to the Corolla SE. In addition to Toyota Entune technology, the Corolla LE and the rest of the Corolla lineup employ standard Toyota Safety Sense technology that includes a Pre-Collision System with Pedestrian Detection, Lane Departure Alert with Steering Assist, Dynamic Radar Cruise Control and Automatic High Beams to improve safety. Tailor-made for the driver in search of a more exciting drive, the sport-tuned Toyota Corolla SE kicks performance up a notch. A performance-tuned suspension pairs with 17-inch alloy wheels, a rear spoiler and bold front fascia to amp up the style and performance of the Corolla SE. Standard Corolla SE models come equipped with the Continuously Variable Transmission and a price tag that stands at $20,445. If you prefer a do-it-yourself drive, the Corolla SE is available with a six-speed manual transmission that will cost just $21,665. Normal and Sport driving modes promise to amplify your day-to-day commute when you choose the Toyota Corolla SE. Additional differences can be found when you get behind the wheel of the Corolla LE and its sport-tuned counterpart. 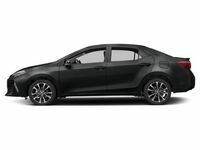 Toyota Corolla SE models employ the luxurious and attractive Toyota SofTex interior, that supplants the premium fabric that is standard in the Corolla LE. 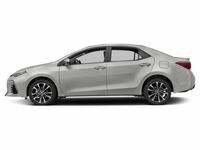 The Toyota Corolla SE adds a wealth of standard technology feature as well that include Toyota Smart Key with push-button start and a 4.2-inch color TFT Multi-Information Display. Visit Downeast Toyota today and explore the differences between the 2017 Toyota Corolla LE and 2017 Toyota Corolla SE trim levels firsthand!